The lots shown on this subdivision map are on Linden's Lane, Temescal St., Birch St., Vernon Ave. (These are the more-or-less east-west streets.) The north-south streets shown are Telegraph Ave., Maple St., Cherry St. and Second Ave. With the exception of Telegraph ave., these street names are no longer being applied to the area shown on the drawing. 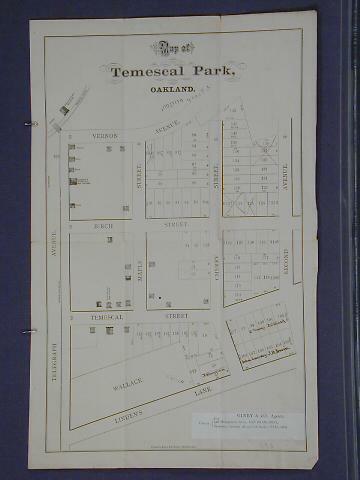 The "Tract List" compiled by Quentin dates the Temescal Park Tract at 1873. Olney & Co. is shown to be the agent for this subdivision.